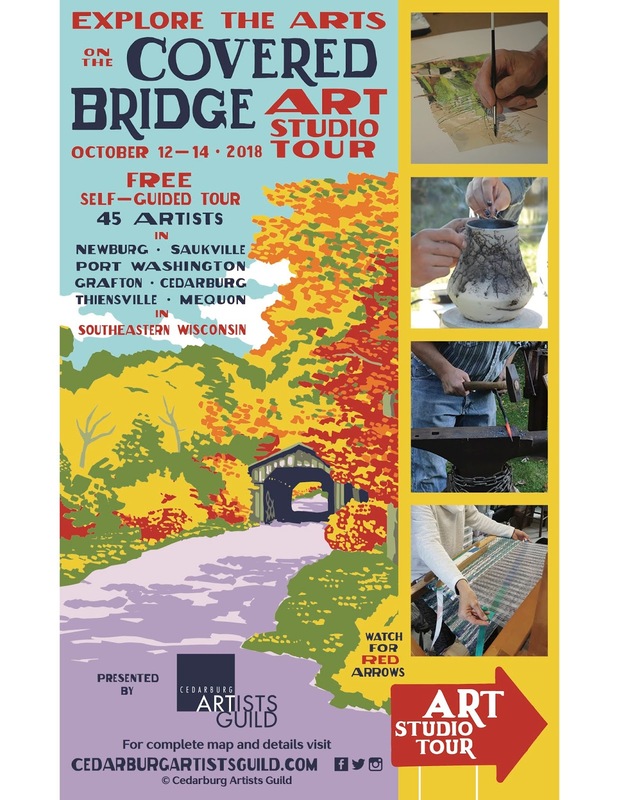 Save the date for the 37 th annual Covered Bridge Art Studio Tour in 2019!! 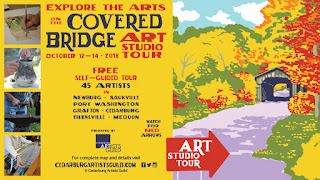 YOUR Covered Bridge Art Studio Tour begins this Friday! Are YOU ready to see some amazing art, meet some talented and engaging artists, get some tips on various creative processes, and maybe, just maybe add to your personal art collection ??? Now is the time to click on the list of artists and the map and plan YOUR FREE self-guided tour. Following our route north to south we are now on Green Bay Road heading toward Thiensville and Mequon. First stop is # 22 Amy Soczka. Am's acrylic compositions are deeply saturated with a palette inspired by nature, geometric patterns and and occasional imaged figure. From Amy's, it is suggested you keep heading south to # 27 where you will find Sam Laturi in his restored barn creating works in steel. Combining the four ancient elements to make objects of art and function. From Sam's continue south on Green Bay Road to # 24: The husband -wife team of Mary and Joseph Mendla. Joseph is the creator of sculptures made of steel while Mary takes on the softer media of fibers and paint creating both wearable art and abstract canvases. The "perfect" marriage of creativity! A little further south, just over the bridge is # 23: Carol Gengler. Carol is an art therapist who not only teaches but creates works in fiber and paint. Her studio is a joy to behold , a visit will always put you in a good mood. Now, head back up north and west a bit along the Milwaukee river to # 25 : Ellen Anderson's home studio. Her thin layers of oil paint are full of the depth, color and realism of nature, wild places and animals. Now head south on Port Washington Road and east to Mequon Road. Close to Lake Michigan you will find # 26. Bridget deLoge's converted family room is now her working studio space where she creates stained glass artworks. Accompanying her is her son, Ryan, newly graduated from college , is an fine art photographer. 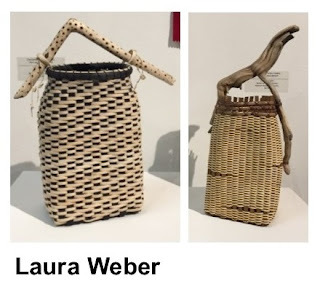 Their guest artists, Barbara Dickmann and Kelly Lemens round out the medium choices with pottery and weavings. This stop has something for everyone ! And as an added boost, just walk across the lawn to #29 where you will find Pam Ruschman's home studio and "garage art gallery ". Pam's oil paintings are created both en plein air in all seasons and in the studio where she paints cows, chickens, pigs and geese. She may even have some chickens visiting during the tour. Now head west on Mequon Road and south on Range Line Road to #28: Lynn Rix's home studio housed in an updated tractor shed on her " farmstead". Lynn's oil paintings are almost all painted en plein air and not in the studio. 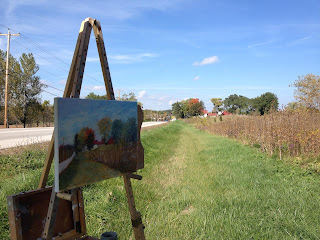 Using an impressionistic style, Lynn paints in all Wisconsin seasons, on site and from life. And the final stop from North to South is # 30. Alice Struck's home studio is full of her expressive and spontaneous watercolors. Landscapes, urbanscapes all infused with light are a delight to view. And so YOUR tour has ended...... Of course you can just reverse the tour if you are starting from the South and going North. And since this is YOUR tour, you can skip some stops ( we hope you won't!) and /or zoom from # 30 to # 1 using I 43 and get from bottom to top in about 25 minutes ! Enjoy! YOUR tour continues. Follow those arrows ! If you have been following the route , you are now very close to the Historic Covered Bridge. One of the few left in Wisconsin. Head east from Susan's studio to Covered Bridge Road and go south. This is a great photo op! Make your own personal art. And now on to downtown Cedarburg. # 12 is Haley Maxine Grebe's studio. Haley was born legally blind with eyes that are very sensitive to light. You will be blown away with the vibrancy of her palette and the intricacy of design. # 15 are the three studios in The Cedar Creek Settlement , a restored woolen mill. Andee Warren will most likely be working her potter's wheel surrounded by her functional plates, cups and bowls. Climb the stairs to Sandra Pape's " garret" full of treasures ! Collages, paintings, jewelry. Then head to Judith Kervin's studio where you will find her creating paintings, prints and jewelry. The creative energy in the mill will delight all of your senses. Heading south of Washington Avenue, you will spot another one of our sponsors, The Santa Fe shop. A shop full of things you never knew you needed but just have to have! Then across the street is the Cedarburg Art Museum. Another of our sponsors. There is a wonderful show going on the fills the Museum with images of " Cedarburg Past and Present ". From there head over to # 10 : Diane Boer-Henke's studio. A converted basement pump room is the space where she creates whimsical, unique hand- built ceramic sculptures. Some are based on people she knows ! Watch out, you could be her next inspiration! Just down the street is # 17 : the new studio space of Claudette Lee-Roseland. A wonderful place to view Claudette's large and small abstract acrylic paintings. Take your time to really look at these pieces, you will be amazed at where your imagination will take you. Head back to Washington Avenue and stop in at another sponsor's shop : Bohemia. Original artwork, jewelry, gifts and more. Cross the street and head to # 18 The Pink LLama where Terri Lockwood, Deb Rolfs and Laura Weber will all be displaying their art and doing demos of their creative processes. Terri , melting wax and mixing pigments for her incaustics, Deb oil painting and Laura weaving her unique baskets. A short walk out the back door and across the street, you will find # 20 . Jack Pachuta is displaying his prints in the Cedarburg History Center. He couldn't fit his press in the door, but he is always more than willing to explain the process of print-making! And his prints are not the " big box store" type ! Cross Cedar Creek, turn left and head to # 16. Tom Kubala's studio space is also his architectural office space. No wonder, Tom's watercolors usually incorporate architectural elements! But these are not " tight" house plans, but rather loose, atmospheric creations. It is time to get back in your car. Hopefully you have made some purchases but still have the desire to continue on YOUR tour ! # 14 is a little bit east on Columbia Road. That is where you will find Beth Hustad. You never know what Beth will be creating next . Scarves made from recycled silk ties, vests, knit hats, mittens. Whatever she creates is wearable, beautiful and one-of a kind. # 9 is Nancee Ariagno's home studio. Her punch-needle designs are fun, affordable, unique and amazing ! Now you have a choice, either head back to town and then head west to # 19 or go west and then south on Highland to Portland to # 21. And then go to # 19. #19 Mary Ellen Mueller will delight you with her prints and oil paintings full of color and whimsy. You will get happy just looking at them ! No photo realism here, just imagination and creativity. # 21 is the Wisconsin Museum of Quilts and Fiber Arts ( a sponsor ) and the host of two of our artists. Katherine de Shazer works in the ancient medium of egg tempera to create her icon paintings inspired by Mother Nature, the cosmos and human nature and the mystery of the universe. Michelle Savas Thompson works in oil both in the studio and en plein air capturing the scenes around her. Landscapes, seascapes, urban scenes, nocturals are some of the inspirations for her vibrant impressionistic creations. And now head down Green Bay Road to Thiensville. You have always have the option to not follow the studios in chronological order. Remember , this is YOUR tour, the way YOU want it. So, instead of heading to # 6 on the map, why not go to # 7 in downtown Grafton. The Arts Mill is housed in a restored mill on the Milwaukee river. Get ready to treat your body to some art !! Ilze Heider's leather designs, Laurie Shovers jewelry and Gina Studelska's fiber art will be difficult for anyone to pass up. Women get ready ! and Men think of the women in your lives who would adore to own one of these wearable art creations. Now head back north out of Grafton to stop at # 6. Kandy Gibson is potter extraordinaire ! You will find her on her wheel, or carving plates, or stoking the fires for raku pots. Her studio is tucked into the lower level of her home and faces a lovely meadow and pond. This is definitely a hands-on place for adults and children. And just north of Kandy is # 8. Linda Litt. Another new medium for you. -Linda works in both photography and watercolor. Her subject matter is as varied as her media and will be a treat for all. After you have tucked a beautiful little watercolor into your car, head west on Pleasant Valley Road to # 11. Four artists with four different media have set up in this converted barn. Try not to ogle at the barn and property and concentrate on the fantastic array of art ! Nancy Going's jewelry is always new and wearable and impossible to resist, Kerri Knapp creates acrylic landscapes depicting nature's infinite beauty , Kerry Tharp takes mosiacs to a level you have most likely never seen before, and Clarey Wamhoff paints whimsical oils and acrylics that will make you happy. This stop is guaranteed to brighten your day. Still have energy? Head a bit farther west and south to # 13 . Susan Hale's studio is nestled into a restored stone out-building. Be ready to for a sensory jolt when you enter into Susan's world of color! Large and small oils painted with big brush strokes and lots of pigment are her trademark. And if you are there on Friday night, she will treat you to s'mores around the camp fire. If you are starting from north of Milwaukee, perhaps you want to work from Newburg to Saukville to Port Washington and then into Grafton. # 1 is Mary Mayhew . Her studio is in a gorgeous barn set back from the road. Don't be dissuaded by the long driveway past the farmhouse and chicken coops. Mary's barn is full of treasures. Still lifes, plein air landscapes, figuratives all rendered in Mary's wonderful impressionistic style. # 2 is Tom Kulich in Saukville. Just a short drive from Newburg. You will find Tom and his art. Whimsical, fun, engaging that is Tom and his wonderful creations in mixed media. # 3 is Renee Schreiner in the Lake Michigan town of Port Washington. 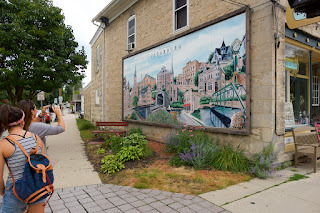 Mary's acrylics capture her travels and her love of Wisconsin and is well worth the stop. A short drive east from Saukville on Hy 33. And while in Port Washington, you should stop at two of our sponsors. Gallery 224 is right on the Lake Michigan and the Port Washington port and Vines to Cellar is the perfect spot to have a rest and enjoy their wine. They are offering a buy one get one for the tour! If you still have energy, continue on to Grafton. Stop at # 4 to see Jeff Austin and his wood working studio. Jeff has both the practical and exquisite ! This is not your run of the mill HG TV word- working shop. Jeff is always happy to demonstrate how his hand tools work their magic. And then close by is # 5. Al Buss's studio with Jeremiah Backhaus set up on the lawn under a tent with his fire and forge. You won't be able to just spend a couple of minutes with these two guys ! Creativity in 3 D ! If you have kids along, you may need to bribe them to leave the fire and Jeremiah. Don't miss out on this fantastic event! Download our map and plan YOUR free self-guided tour today! Only 9 days until YOUR tour begins. The Road signs are out ! Count down begins ! 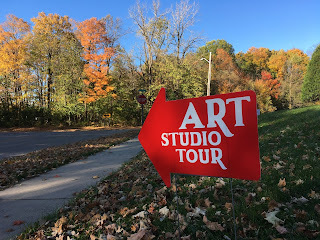 Only 10 more days until THE BEST Art Studio Tour in Wisconsin !!! Click on our map and plan your free, self-guided route now !! 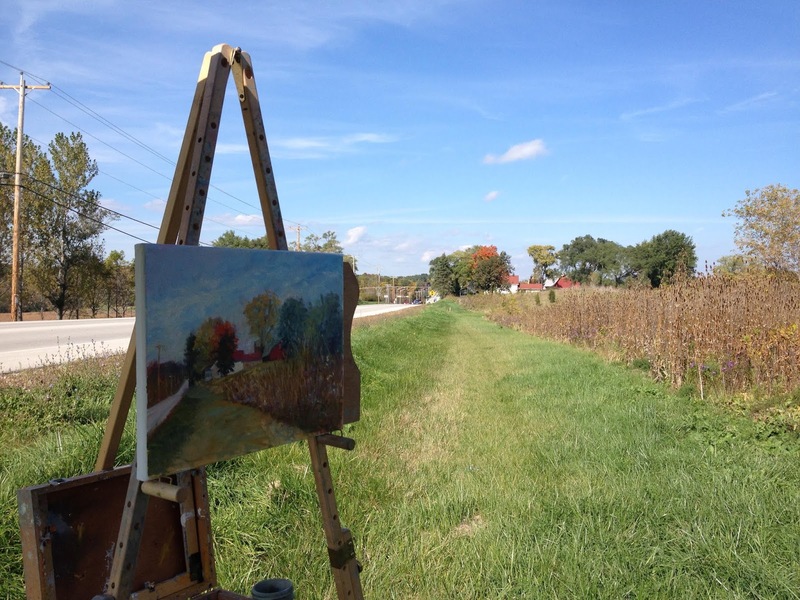 Wisconsin Fall colors are always an inspiration for the local Plein Air Artists . 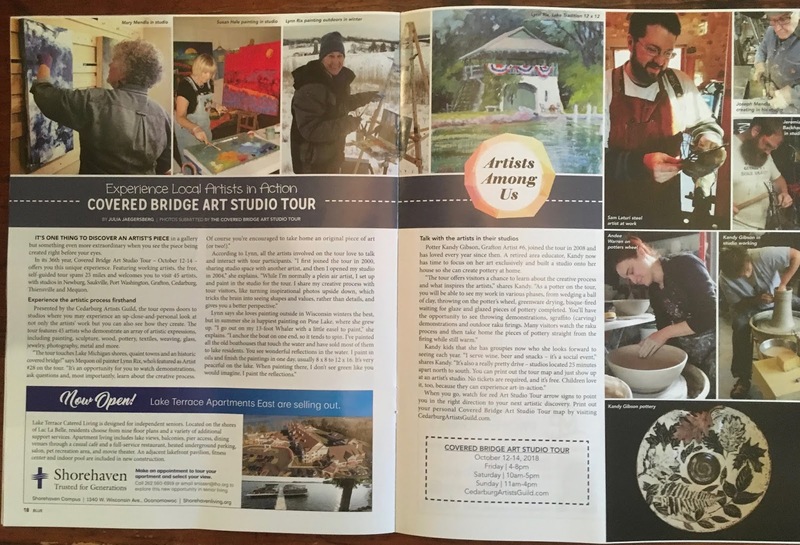 Covered Bridge Art Studio Tour in the News! We are so excited to share this great article about the tour ! Published in the October issue of Blue Magazine. Opens today ! Free sneak peak at some of the artists' work that will be available on the tour. Partnership Bank/ Cedarburg Branch on Washington Avenue in Cedarburg invites you to walk through their lobby and view some great art ! Get a glimpse of the Tour artists' work to help you map out your route for the tour. Open during banking hours. The Cedarburg Artists Guild presents its 36th year of the Covered Bridge Art Studio Tour. It is FREE, self-guilded, no tickets, no lines. October 12 -14. 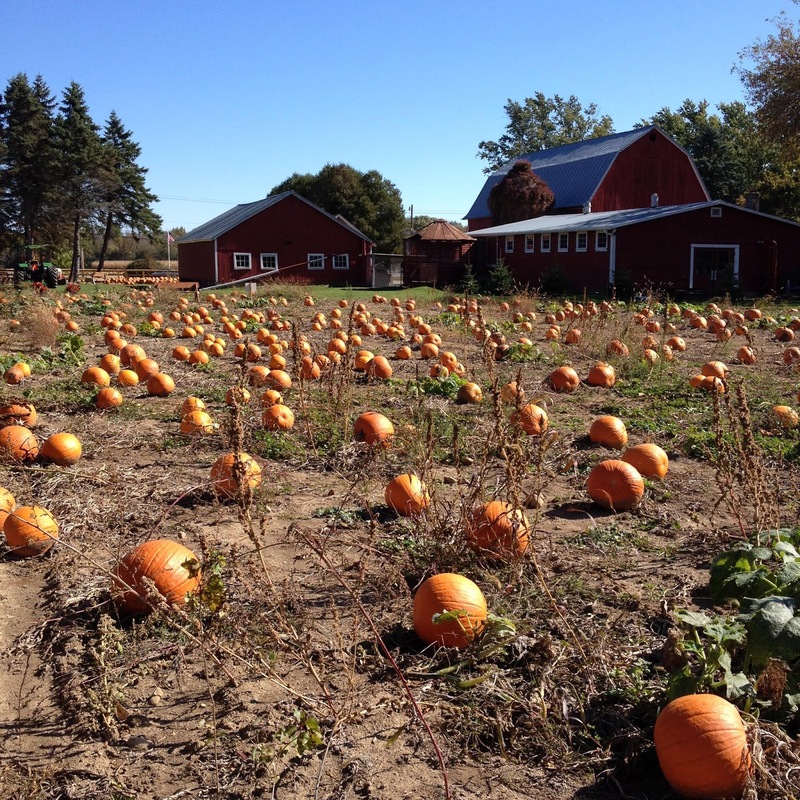 A wonderful way for the whole family to enjoy a Wisconsin Fall week-end. 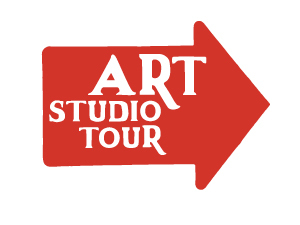 Please go to our website and download a map of the artists' locations and plan YOUR FREE TOUR now ! See you on the tour ! There are several pumpkin farms along your route . Perhaps the kids would like to stop and pick out their Halloween Jack O’ Lantern ! Four of our tour artists win awards ! Four of our tour artists won awards for " Best Body of Work " at the Cedarburg Artists Guild Annual Juried Exhibit ! The show hangs at the Cedarburg Cultural Center through Sunday, October 14. We invite you to stop in and view the artworks. This is a juried show and includes numerous other artists on the tour. Mark your calendars to stop into the lobby of the Cedarburg branch of Partnership Bank ( the premier tour sponsor ). 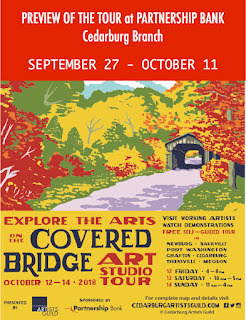 Get a preview of some of the art you will see on the Covered Bridge Art Studio Tour. September 27- October 11. 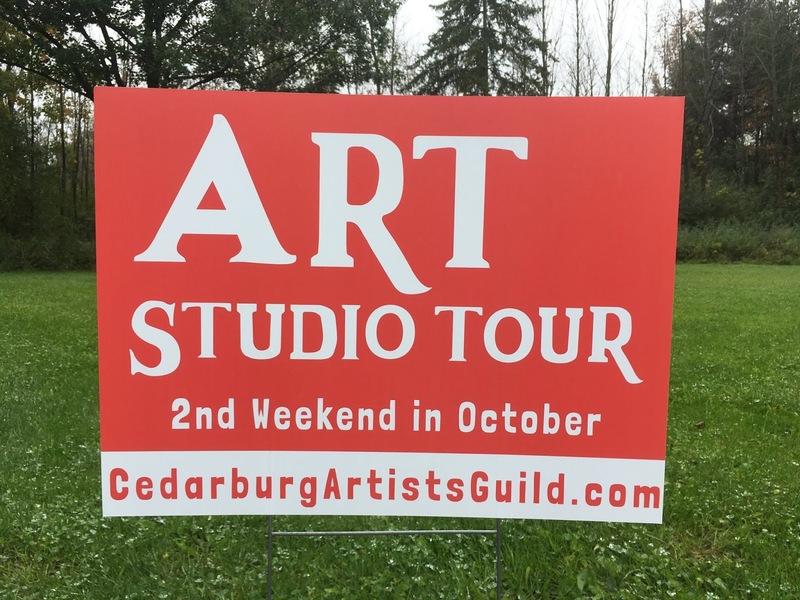 Cedarburg and all of the communities on the Art Studio Tour embrace the arts. 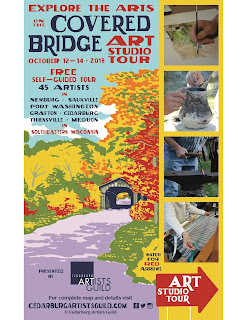 The Covered Bridge Art Studio Tour is celebrating its 36th year ! You are invited to download a map of the artists' locations and plan your OWN FREE tour of 45 talented artists. Go to www.cedarburgartistsguild.com/coveredbridgeartstudiotour.html to begin your weekend ! 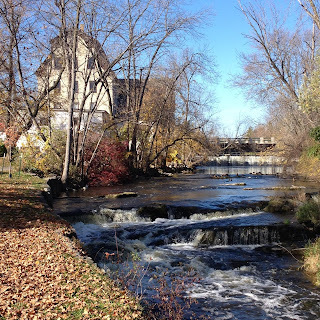 Your drive from studio to studio will most likely take you past Cedar Creek in Cedarburg . The Columbia Flour Mill was built in 1845 by  Friedrich Hilgen and William Schroeder. Germans who came to Cedarburg by way of Charleston South Carolina . The mill was built on rock with limestone walls 3 or more feet thick . In the lower level you can still view the water rushing through . 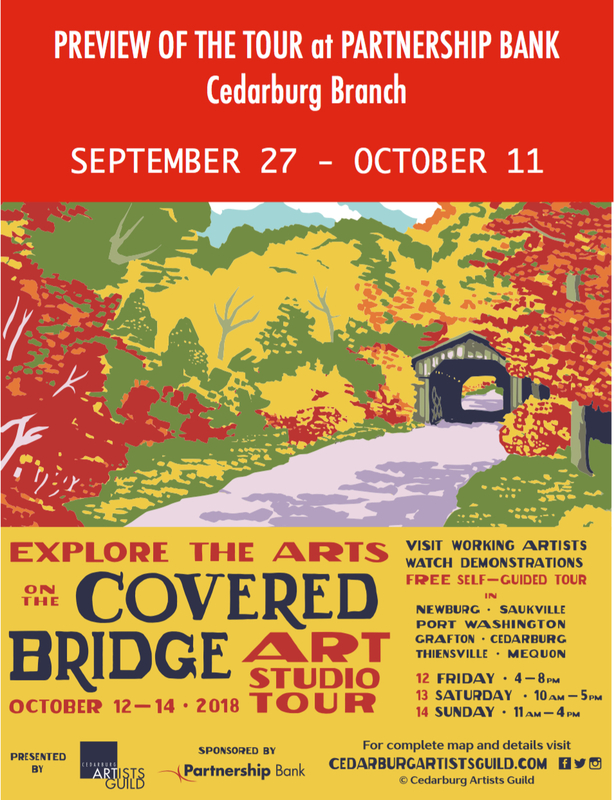 You are invited to stop into the lobby of the Cedarburg branch of Partnership Bank on Washington Avenue for a free preview of the Covered Bridge Art Studio Tour. September 27- October 11. Get a sneak peek at the art on the tour ! 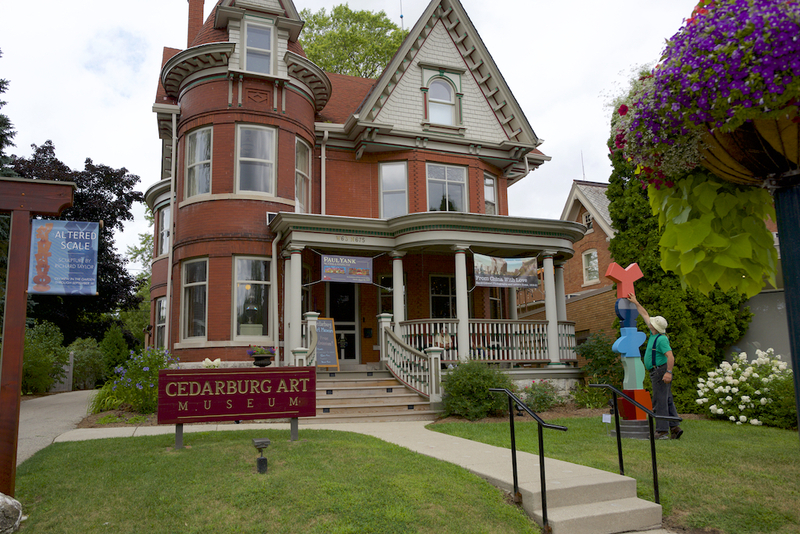 One of the sponsors of the Art Studio Tour is the beautiful Cedarburg Art Museum. The museum is housed in an historic brick home. You are encouraged to stop in, admission is free, and view the wonderful art on display. There will be several shows running with some of the art for sale. There is also a wonderful shop stocked with unusual one of a kind gifts. Our generous sponsor, Gallery 224 in Port Washington has just announced a new show and new hours !! The Art of Papercutting opens September 14, at Gallery 224, with a reception from 5-7:00. The show runs through November 3. Jose A. Chavez, one of the featured artist, and co-curator will be giving a talk on Saturday, September 29 from 10-11:30. New Hours Gallery 224 will be open Thursday, Friday and Saturday, 10:00-3:00. New Artists Andrew Musil and Tori Tasch join the artists at Studio 224. 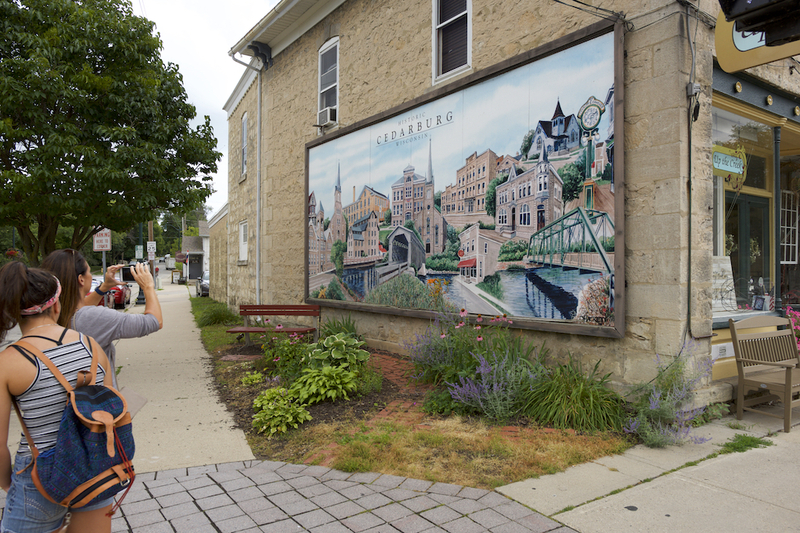 New Partnership ARTservancy – is a new partnership between the Ozaukee Washington Land Trust and Gallery 224, promoting the visionary work of artists and the Land Trust. This is a yearlong program culminating in an exhibition at Gallery 224 next September.